This website is about helping people create more fulfilled lives and building a community of solopreneurs. It is not primarily financially driven. 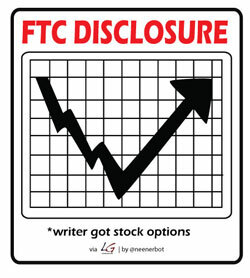 Nonetheless, beginning December 1, 2009, the FTC requires bloggers to provide disclosures whenever there could be hidden interests or unspoken biases related to recommendations. Per the FTC rules, I need to specify an Amazon link that gets me 10 cents instead of an Amazon link that gets me 0 cents. If I promote the non-profit I advise (Traveling Stories) that’s another disclaimer. If I offer my consulting in a blog post, there’s another. Disclaimers all over the place. This would be tedious for me and a continual eye sore for readers—but rules are rules.